To begin, lay the card-stock or half sheet of poster-board in front of your little artist. Set out all the mark making materials within easy reach. Encourage your little artist to make a variety of squiggles, dots, and shapes on the paper with each of the materials. Can they make crazy lines, or would they rather create a pattern or a picture? After your little artist has filled the page with colors, shapes, and lines, roll the paper into a cylinder and staple it together (this is grown-up work). Punch 2 holes at the top of the cylinder and thread a piece of yarn or ribbon through to create a loop from which to hang the windsock. Help your little artist cut or tear strips of colorful crate paper and/or ribbon. Staple each to the bottom of the windsock. Hang the windsock outside and watch it blow in the wind. You can use any type of paper, but I find card-stock and poster-board hold up better in the wind. Create multiple windsocks and hang throughout your house or yard for beautiful springtime decorations. 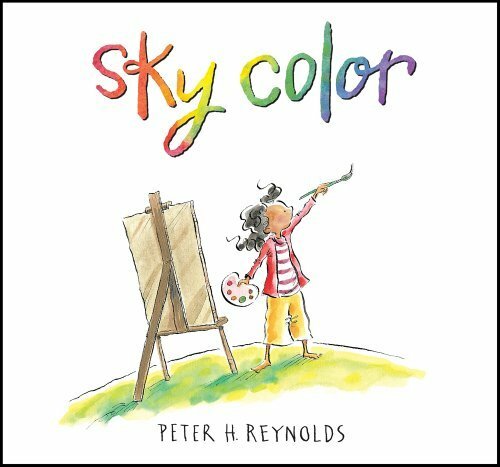 Before or after your wind sock project, read the book Sky Color by Peter H. Reynolds together with your little artist.